....to go back to school! More importantly, it's time to design your space for your new dorm room or apartment. Print (Em) frames are perfect for wall art, sure, but there are so many more uses for the signature geometric frame. >>// Have a shared cork board in your apartment? Keep your section separate from your roommates with a simple frame. Each roommate can have a different color, or use different pushpins. 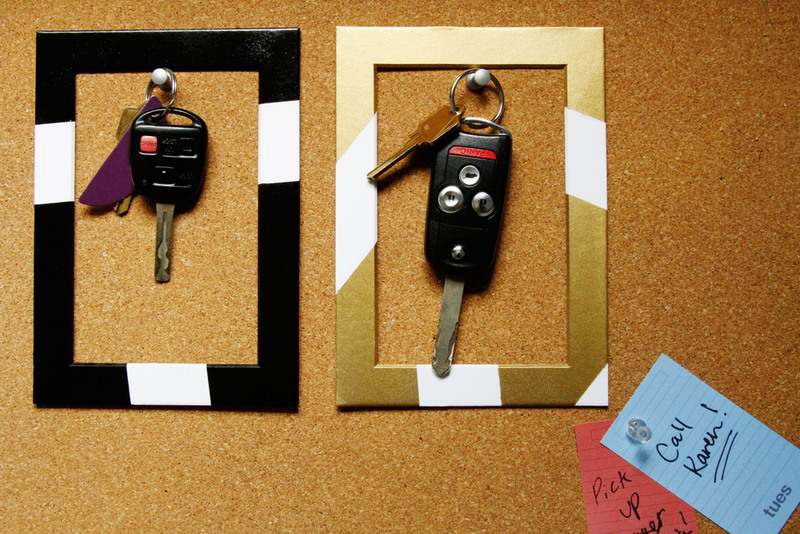 I LOVE the idea of using frames for your keys. Hang your keys off of a pushpin + you will never have to wonder where the heck they went ever again. >>// My larger frames are great for your weekly calendar, too. Use different colored sticky notes for each day of the week. The frame contains the notes, and keeps them separate from others on your cork board. >>// Who doesn't have a whiteboard in college? I am digging this pink and gold combo. Since the frames are super light the magnets hold up the frames preventing them from slipping off. The space within the frame can be used for urgent messages to your roommates or notes for yourself. Have ideas of your own? Let me know below, and always tag your images with #printem so I can see what you come up with!